Many of us are well-aware that social-emotional skills are critically important for developing positive peer relationships, as well as in establishing a classroom culture that promotes learning, sharing, and taking risks. It's not only about students being able to understand their own feelings and others' feelings, but how to learn to manage conflicts, navigate social problems, regulate emotions, communicate in a pro-social manner, and approach the world with a healthy attitude. 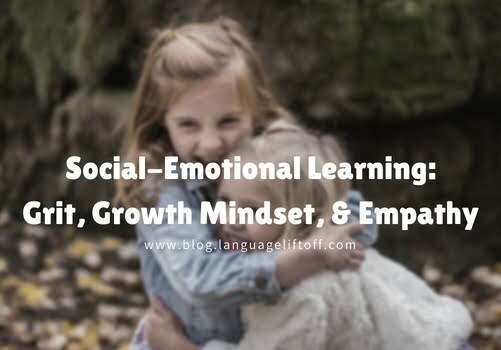 As the school year is beginning for many around the nation and world, consider watching these three short videos on Social & Emotional Learning, and answering the essential and reflection questions! Angela Duckworth is a psychology professor at the University of Pennsylvania who studies what makes some people more successful than others. As you watch the video, think about the following: What is grit and what how does it influence success? What is grit, and how does it influence success? Think about a moment in your own life when you showed grit. What happened? How did grit impact you in that moment? Explain. This video describes the differences between a growth mindset and a fixed mindset. As you watch the video, think about the following: How can developing a growth mindset impact your life? How can developing a growth mindset impact your life? Think of a time when you demonstrated a fixed mindset. What could you have done differently in that situation to demonstrate a growth mindset? How would this have affected you differently in the situation? As you watch this video, think about a time when you experienced empathy. Describe a time when you experienced empathy. Use evidence from the video and from your experience to explain why the experience qualifies as empathy. I hope you find these resources to be helpful. Have a wonderful start to the school year!